Probably no area in Oklahoma enjoys a more fascinating history than Cooweescoowee District, Cherokee Nation, which encompasses the area referred to as “The Will Rogers Country.” It’s modern version as we know it began about 144 years ago when Jean Pierre Chouteau persuaded some of the Osage Indians, with whom he held exclusive trading rights from the French government, to move from their Osage River homes in Kansas and Missouri to this area. He established a trading post at Salina on Grand River in 1796 to keep them supplied and buy their furs. This was 7 years before U. S. government acquired title to this area (1803) through the Louisiana Purchase. This was written for the Ranchman magazine and appeared in the November 1961 issue. Watch for Part II of this article. There were probably no pretentious Cherokee homes in the Will Rogers Country prior to the War Between the States. While the Cherokee men folks were away at war, some in northern armies and some in southern, outlaws, renegades, deserters and bush whackers over ran the country and drove off all livestock, burned most building and practically reverted the land to its virgin state. In the case of the John Chambers family of the Verdigris community, the women and children walked to Tahlequah with just what possessions they could carry, for renegades had stolen all of their livestock, wagons and equipment. They joined a caravan to Texas until after the war. After the war, Cherokee citizens returned to Cooweescoowee District. Among the first acts were to establish 3 Cherokee schools, 3 voting precincts and a seat of government. Westpoint school near John Schrimsher’s, 1 mile south of present Claremore was built in 1867. It was near a spring which still flows, and the ruts left in the trail by the old stage coaches and wagons are still plainly visible near the spring. This school functioned until near statehood and provided the only opportunity for education of Cherokee children of this area for many years. It was also in 1867 that the seat of government was moved from Skiatook, where it had been temporarily established at Roger’s store, to the spring near Josiah Henry’s cow pasture. After construction of a courthouse, and Jerome Kephart built a boarding house, it became known as Kephart Springs courthouse. It is about five miles northeast of Claremore. It was also in 1867 that the Delaware Indians were removed to the Cherokee Nation and Chief Charles Journeycake established old Alluwe, which he called Lightning Creek Post Office. Major Lipe established his old Oowala store and blacksmith shop, John Bullette established his Mt. Claremore store, and Teece Chambers built his Ponlas store near Verdigris. The founding of Coffeyville, Kansas, in 1871 started a trend in trading toward Kansas, and Vinita, which was found in 1868, rather than with Fort Smith, for the round trip took only two days. It was also in 1867 that Texas cattlemen began to drive herds of cattle to the railroad terminal at Baxter Springs, Kansas. By 1870 many of the herds were routed up the Verdigris River. Monte Price was on a drive in 1867 or 1868 which went between the round Mounds at Oowala. Once the cattle men got a look at the tall grasses of Indian Territory they conspired to graze them. Since ownership was vested in the Cherokee Nation, only Cherokee citizens could run cattle on them. The Cherokees and cattlemen got around this by the latter selling his herd to the prominent Cherokees for $1.00 per head, and collecting the balance on them when the cattle were sold. The cattle drives through the Indian and Oklahoma Territories continued through the 1880’s. The resistance of Cherokees and Kansas settlers increased because of Texas fever. Cattlemen kept routing the cattle further and further west to avoid the settlements. But the construction of railroads finally made the cattle drives unnecessary. The construction of the M.K . & T. Railroad from Vinita through Pryor Creek and Chouteau occurred about 1875. The Frisco was extended through Claremore in 1882 and the Iron Mountain through Claremore in 1889. This construction sets the pattern for settlement. 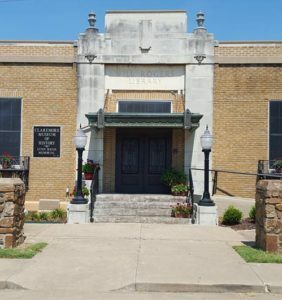 Teecy Chambers and John Bullette each tried to be the first to build a store at Claremore Station. Tulsey Town was founded in 1882 also, and everyone thought Claremore had the best prospects of the two. After Dr. Theobald Smith proved through research that Texas fever was caused by ticks Oklahoma passed the dipping law. This was remarkably difficult research because adult ticks did not infect cattle. The germ was passed through the egg and seed ticks to the cattle. Surveys were made between 1898 and statehood and section lines laid out. Dora Tucker of Foyil thinks the grading of section lines, fencing of pastures to confine cattle, and burning of grasslands to kill ticks all had a strong part in reducing the acres of native grasslands. A few part-Cherokee citizens with foresight laid foundation ranches by leasing or otherwise acquiring many allotments to go with their own. Schools and churches have largely consolidated in the cities and community centers to serve several square miles. Most rural roads are all-weather. The only threat to alteration of this era of ranch and livestock operation is the trend to urbanization. Many families prefer to live in the country and purchase 5 to 10 acres on which to build a country home. With a few poultry, a cow for milk, a horse for the children to ride, a private swimming pool and fishing hole in their farm pond, the glorious days of spring, summer or autumn around them, and rural electricity and gas delivered in tanks, they never had it so good. As for America, perhaps it is much better for us all to have a little land worth defending. This article was written for the Ranchman magazine and appeared in the November 1961 issue.